For a topical guide to this subject, see Outline of the metric system. For a more accessible and less technical introduction to this topic, see Introduction to the metric system. The metric system is an internationally recognised decimalised system of measurement. It is in widespread use, and where it is adopted, it is the only or most common system of weights and measures (see metrication). It is now known as the International System of Units (SI). It is used to measure everyday things such as the mass of a sack of flour, the height of a person, the speed of a car, and the volume of fuel in its tank. It is also used in science, industry and trade. In its modern form, it consists of a set of base units including metre for length, kilogram for mass, second for time and ampere for electrical current, and a few others, which together with their derived units, can measure any physical quantity. Metric system may also refer to other systems of related base and derived units defined before the middle of the 20th century, some of which are still in limited use today. The metric system was designed to have properties that make it easy to use and widely applicable, including units based on the natural world, decimal ratios, prefixes for multiples and sub-multiples, and a structure of base and derived units. It is also a coherent system, which means that its units do not introduce conversion factors not already present in equations relating quantities. It has a property called rationalisation that eliminates certain constants of proportionality in equations of physics. The units of the metric system, originally taken from observable features of nature, are now defined by phenomena such as the microwave frequency of a caesium atomic clock which accurately measures seconds. One unit, the kilogram, remains defined in terms of a man-made artefact, but scientists recently voted to change the definition to one based on Planck's constant via a Kibble balance. The new definition is expected to be formally propagated on 20 May 2019. While there are numerous named derived units of the metric system, such as watt and lumen, other common quantities such as velocity and acceleration do not have their own unit, but are defined in terms of existing base and derived units such as metres per second for velocity. Though other currently or formerly widespread systems of weights and measures continue to exist, such as the British imperial system and the US customary system of weights and measures, in those systems most or all of the units are now defined in terms of the metric system, such as the US foot which is now a defined decimal fraction of a metre. The metric system is also extensible, and new base and derived units are defined as needed in fields such as radiology and chemistry. The most recent derived unit, the katal, for catalytic activity, was added in 1999. Recent changes are directed toward defining base units in terms of invariant constants of physics to provide more precise realisations of units for advances in science and industry. Together they are sufficient for measuring any known quantity, without reference to further quantities or phenomena. The metre, ampere, candela, and mole are all defined in terms of other base units. For example, the speed of light is defined as 299,792,458 metres per second, and the metre is derived from that constant and the definition of a second. As a result, in dimensional analysis, they remain wholly separate concepts. There are currently 22 derived units with special names in the metric system, these are defined in terms of the base units or other named derived units. Non-SI units whose values in SI units must be obtained experimentally (Table 7). This list includes various units of measure used in atomic and nuclear physics and in astronomy such as the dalton, the electron mass, the electron volt, the astronomical unit, the solar mass, and a number of other units of measure that are well-established, but dependent on experimentally-determined physical quantities. Other non-SI units (Table 8). This list catalogues a number of units of measure that have been used internationally in certain well-defined spheres including the bar for pressure, the ångström for atomic physics, the nautical mile and the knot in navigation. Non-SI units associated with the CGS and the CGS-Gaussian system of units (Table 9). This table catalogues a number of units of measure based on the CGS system and dating from the nineteenth century. They appear frequently in the literature, but their continued use is discouraged by the CGPM. The SI symbols for the metric units are intended to be identical, regardless of the language used but unit names are ordinary nouns and use the character set and follow the grammatical rules of the language concerned. For example, the SI unit symbol for kilometre is "km" everywhere in the world, even though the local language word for the unit name may vary. Language variants for the kilometre unit name include: chilometro (Italian), Kilometer (German),[Note 1] kilometer (Dutch), kilomètre (French), χιλιόμετρο (Greek), quilómetro/quilômetro (Portuguese), kilómetro (Spanish) and километр (Russian). Variations are also found with the spelling of unit names in countries using the same language, including differences in American English and British spelling. For example, meter and liter are used in the United States whereas metre and litre are used in other English-speaking countries. In addition, the official US spelling for the rarely used SI prefix for ten is deka. In American English the term metric ton is the normal usage whereas in other varieties of English tonne is common. Gram is also sometimes spelled gramme in English-speaking countries other than the United States, though this older usage is declining. In SI, the unit of power is the "watt", which is defined as "one joule per second". In the US customary system of measurement the unit of power is the "horsepower", which is defined as "550 foot-pounds per second" (the pound in this context being the pound-force). Similarly, neither the US gallon nor the imperial gallon is one cubic foot or one cubic yard— the US gallon is 231 cubic inches and the imperial gallon is 277.42 cubic inches. The concept of coherence was only introduced into the metric system in the third quarter of the 19th century; in its original form the metric system was non-coherent—in particular the litre was 0.001 m3 and the are (from which the hectare derives) was 100 m2. However the units of mass and length were related to each other through the physical properties of water, the gram having been designed as being the mass of one cubic centimetre of water at its freezing point. 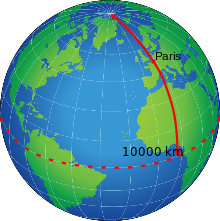 The metre was originally defined to be one ten millionth of the distance between the North Pole and the Equator through Paris. The base units used in the metric system must be realisable. Each of the definitions of the base units in SI is accompanied by a defined mise en pratique [practical realisation] that describes in detail at least one way in which the base unit can be measured. Where possible, definitions of the base units were developed so that any laboratory equipped with proper instruments would be able to realise a standard without reliance on an artefact held by another country. In practice, such realisation is done under the auspices of a mutual acceptance arrangement (MAA). The standard metre is defined as exactly 1/299,792,458 of the distance that light travels in a second. The realisation of the metre depends in turn on precise realisation of the second. There are both astronomical observation methods and laboratory measurement methods that are used to realise units of the standard metre. Because the speed of light is now exactly defined in terms of the metre, more precise measurement of the speed of light does not result in a more accurate figure for its velocity in standard units, but rather a more accurate definition of the metre. The accuracy of the measured speed of light is considered to be within 1 m/s, and the realisation of the metre is within about 3 parts in 1,000,000,000, or an order of 10−9 parts. The kilogram is defined by the mass of a man-made artefact of platinum-iridium held in a laboratory in France, until the new definition takes place in May 2019. Replicas made in 1879 at the time of the artefact's fabrication and distributed to signatories of the Metre Convention serve as de facto standards of mass in those countries. Additional replicas have been fabricated since as additional countries have joined the convention. The replicas are subject to periodic validation by comparison to the original, called the IPK. It has become apparent that either the IPK or the replicas or both are deteriorating, and are no longer comparable: they have diverged by 50 μg since fabrication, so figuratively, the accuracy of the kilogram is no better than 5 parts in a hundred million or within an order of 10−8 parts. The accepted redefinition of SI base units replaces the IPK with an exact definition of Planck's constant, which defines the kilogram in terms of the second and metre. Although the metric system has changed and developed since its inception, its basic concepts have hardly changed. Designed for transnational use, it consisted of a basic set of units of measurement, now known as base units. Derived units were built up from the base units using logical rather than empirical relationships while multiples and submultiples of both base and derived units were decimal-based and identified by a standard set of prefixes. Like most units of measure, the units of the metric system were based on perceptual quantities of the natural world. But they also had definitions in terms of stable relationships in that world: a metre was defined not by the span of a man's arms like a toise, but on a quantitative measure of the earth. A kilogram was defined by a volume of water, whose linear dimensions were fractions of the unit of length. The earth was not easy to measure, nor was it uniformly shaped, but the principle that units of measure were to be based on quantitative relationships among invariant facets of the physical world was established. The units of the metric system today still adhere to that principle, but the relationships used are based on the physics of nature, rather than its sensory dimensions. The metric system base units were originally adopted because they represented fundamental orthogonal dimensions of measurement corresponding to how we perceive nature: a spatial dimension, a time dimension, one for the effect of gravitation, and later, a more subtle one for the dimension of an "invisible substance" known as electricity or more generally, electromagnetism. One and only one unit in each of these dimensions was defined, unlike older systems where multiple perceptual quantities with the same dimension were prevalent, like inches, feet and yards or ounces, pounds and tons. Units for other quantities like area and volume, which are also spacial dimensional quantities, were derived from the fundamental ones by logical relationships, so that a unit of square area for example, was the unit of length squared. Many derived units were already in use before and during the time the metric system evolved, because they represented convenient abstractions of whatever base units were defined for the system, especially in the sciences. So analogous units were scaled in terms of the metric units, and their names adopted into the system. Many of these were associated with electromagnetism. Other perceptual units, like volume, which were not defined in terms of base units, were incorporated into the system with definitions in the metric base units, so that the system remained simple. It grew in number of units, but the system retained a uniform structure. Some customary systems of weights and measures had duodecimal ratios, which meant quantities were conveniently divisible by 2, 3, 4, and 6. But it was difficult to do arithmetic with things like ​1⁄4 pound or ​1⁄3 foot. There was no system of notation for successive fractions: for example, ​1⁄3 of ​1⁄3 of a foot was not an inch or any other unit. But the system of counting in decimal ratios did have notation, and the system had the algebraic property of multiplicative closure: a fraction of a fraction, or a multiple of a fraction was a quantity in the system, like ​1⁄10 of ​1⁄10 which is ​1⁄100. So a decimal radix became the ratio between unit sizes of the metric system. In the early days, multipliers that were positive powers of ten were given Greek-derived prefixes such as kilo- and mega-, and those that were negative powers of ten were given Latin-derived prefixes such as centi- and milli-. However, 1935 extensions to the prefix system did not follow this convention: the prefixes nano- and micro-, for example have Greek roots. During the 19th century the prefix myria-, derived from the Greek word μύριοι (mýrioi), was used as a multiplier for 7004100000000000000♠10000. When applying prefixes to derived units of area and volume that are expressed in terms of units of length squared or cubed, the square and cube operators are applied to the unit of length including the prefix, as illustrated below. Prefixes are not usually used to indicate multiples of a second greater than 1; the non-SI units of minute, hour and day are used instead. On the other hand, prefixes are used for multiples of the non-SI unit of volume, the litre (l, L) such as millilitres (ml). James Clerk Maxwell played a major role in developing the concept of a coherent CGS system and in extending the metric system to include electrical units. hold without the introduction of unit conversion factors. Once a set of coherent units have been defined, other relationships in physics that use those units will automatically be true. Therefore, Einstein's mass–energy equation, E = mc2, does not require extraneous constants when expressed in coherent units. The CGS system had two units of energy, the erg that was related to mechanics and the calorie that was related to thermal energy; so only one of them (the erg) could bear a coherent relationship to the base units. Coherence was a design aim of SI, which resulted in only one unit of energy being defined – the joule. Maxwell's equations of electromagnetism contained a factor relating to steradians, representative of the fact that electric charges and magnetic fields may be considered to emanate from a point and propagate equally in all directions, i.e. spherically. This factor appeared awkwardly in many equations of physics dealing with the dimensionality of electromagnetism and sometimes other things. The International System of Units is the modern metric system. It is based on the Metre-Kilogram-Second-Ampere (MKSA) system of units from early in the 20th century. It also includes numerous coherent derived units for common quantities like power (watt) and irradience (lumen). Electrical units were taken from the International system then in use. Other units like those for energy (joule) were modeled on those from the older CGS system, but scaled to be coherent with MKSA units. Two additional base units, degree Kelvin equivalent to degree Centigrade for thermodynamic temperature, and candela, roughly equivalent to the international candle unit of illumination, were introduced. Later, another base unit, the mole, a unit of mass equivalent to Avogadro's number of specified molecules, was added along with several other derived units. The system was promulgated by the General Conference on Weights and Measures (French: Conférence générale des poids et mesures – CGPM) in 1960. At that time, the metre was redefined in terms of the wavelength of a spectral line of the krypton-86[Note 3] atom, and the standard metre artefact from 1889 was retired. Today, the International system of units consists of 7 base units and innumerable coherent derived units including 22 with special names. The last new derived unit, the katal for catalytic activity, was added in 1999. Some of the base units are now realised in terms of invariant constants of physics. As a consequence, the speed of light has now become an exactly defined constant, and defines the metre as ​1⁄299,792,458 of the distance light travels in a second. The kilogram remains defined by a man-made artefact of platinum-iridium, and it is deteriorating. The range of decimal prefixes has been extended to those for 1024, yotta, and 10−24, yocto, which are unfamiliar because nothing in our everyday lives is that big or that small. The International System of Units has been adopted as the official system of weights and measures by all nations in the world except for Myanmar, Liberia, and the United States, while the United States is the only industrialised country where the metric system is not the predominant system of units. There are 192 countries that predominantly use the metric system and 3 that do not. A number of variants of the metric system evolved, all using the Mètre des Archives and Kilogramme des Archives (or their descendants) as their base units, but differing in the definitions of the various derived units. In 1832, Gauss used the astronomical second as a base unit in defining the gravitation of the earth, and together with the gram and millimetre, became the first system of mechanical units. Several systems of electrical units were defined following discovery of Ohm's law in 1824. The centimetre–gram–second system of units (CGS) was the first coherent metric system, having been developed in the 1860s and promoted by Maxwell and Thomson. In 1874, this system was formally promoted by the British Association for the Advancement of Science (BAAS). The system's characteristics are that density is expressed in g/cm3, force expressed in dynes and mechanical energy in ergs. Thermal energy was defined in calories, one calorie being the energy required to raise the temperature of one gram of water from 15.5 °C to 16.5 °C. The meeting also recognised two sets of units for electrical and magnetic properties – the electrostatic set of units and the electromagnetic set of units. The CGS units of electricity were cumbersome to work with. This was remedied at the 1893 International Electrical Congress held in Chicago by defining the "international" ampere and ohm using definitions based on the metre, kilogram and second. In 1901, Giovanni Giorgi showed that by adding an electrical unit as a fourth base unit, the various anomalies in electromagnetic systems could be resolved. The metre–kilogram–second–coulomb (MKSC) and metre–kilogram–second–ampere (MKSA) systems are examples of such systems. The International System of Units (Système international d'unités or SI) is the current international standard metric system and is also the system most widely used around the world. It is an extension of Giorgi's MKSA system—its base units are the metre, kilogram, second, ampere, kelvin, candela and mole. The MKS (Metre, Kilogram, Second) system came into existence in 1889, when artefacts for the metre and kilogram were fabricated according to the convention of the Metre. Early in the 20th century, an unspecified electrical unit was added, and the system was called MKSX. When it became apparent that the unit would be the ampere, the system was referred to as the MKSA system, and was the direct predecessor of the SI. The metre–tonne–second system of units (MTS) was based on the metre, tonne and second – the unit of force was the sthène and the unit of pressure was the pièze. It was invented in France for industrial use and from 1933 to 1955 was used both in France and in the Soviet Union. Gravitational metric systems use the kilogram-force (kilopond) as a base unit of force, with mass measured in a unit known as the hyl, Technische Mass Einheit (TME), mug or metric slug. Although the CGPM passed a resolution in 1901 defining the standard value of acceleration due to gravity to be 980.665 cm/s2, gravitational units are not part of the International System of Units (SI). Due to serious medication errors having resulted from confusion between mg and μg, doses of less than one milligram must be expressed in micrograms written in full (the symbol μg being banned) in the Scottish health service. Flying an overloaded American International Airways aircraft from Miami, Florida to Maiquetia, Venezuela on 26 May 1994. The degree of overloading was consistent with ground crew reading the kilogram markings on the cargo as pounds. In 1999 the Institute for Safe Medication Practices reported that confusion between grains and grams led to a patient receiving phenobarbital 0.5 grams instead of 0.5 grains (0.03 grams) after the practitioner misread the prescription. The Canadian "Gimli Glider" accident in 1983, when a Boeing 767 jet ran out of fuel in mid-flight because of two mistakes made when calculating the fuel supply of Air Canada's first aircraft to use metric measurements: mechanics miscalculated the amount of fuel required by the aircraft as a result of their unfamiliarity with metric units. The root cause of the loss in 1999 of NASA's US$125 million Mars Climate Orbiter was a mismatch of units – the spacecraft engineers calculated the thrust forces required for velocity changes using US customary units (lbf⋅s) whereas the team who built the thrusters were expecting a value in metric units (N⋅s) as per the agreed specification. During its evolution, the metric system has adopted many units of measure. The introduction of SI rationalised both the way in which units of measure were defined and also the list of units in use. These are now catalogued in the official SI Brochure. The table below lists the units of measure in this catalogue and shows the conversion factors connecting them with the equivalent units that were in use on the eve of the adoption of SI. ^ Strictly speaking, weak and strong charges may add two base dimensions: see Chyla, W.T. (December 2011). "Evolution of the International Metric System of Units SI" (PDF). Acta Physica Polonica A. 120 (6): 998–1011. ^ "Online Translation—Offering hundreds of dictionaries and translation in more than 800 language pairs". Babylon. Retrieved 5 February 2011. ^ "Weights and Measures Act 1985 (c. 72)". The UK Statute Law Database. Office of Public Sector Information. Archived from the original on 12 September 2008. Retrieved 26 January 2011. § 92. ^ "Horsepower". Encyclopædia Britannica Online. 2013. Retrieved 5 April 2013. ^ MacLean, RW (20 December 1957). "A Central Program for Weights and Measures in Canada". Report of the 42nd National Conference on Weights and Measures 1957. National Bureau of Standards. p. 47. Miscellaneous publication 222. Retrieved 8 May 2013. ^ J C Maxwell (1873). A treatise on electricity and magnetism. 2. Oxford: Clarendon Press. pp. 242–245. Retrieved 12 May 2011. ^ "La loi du 18 Germinal an 3 la mesure [républicaine] de superficie pour les terrains, égale à un carré de dix mètres de côté" [The law of 18 Germanial year 3 "The republican measures of land area equal to a square with sides of ten metres"] (in French). Le CIV (Centre d'Instruction de Vilgénis) – Forum des Anciens. Retrieved 2 March 2010. ^ "What is a mise en pratique?". BIPM. 2011. Retrieved 11 March 2011. ^ "OIML Mutual Acceptance Arrangement (MAA)". International Organisation of Legal Metrology. Archived from the original on 21 May 2013. Retrieved 23 April 2013. ^ McGreevy, Thomas (1997). Cunningham, Peter (ed.). The Basis of Measurement: Volume 2—Metrication and Current Practice. Chippenham: Picton Publishing. pp. 222–223. ISBN 978-0-948251-84-9. ^ Brewster, D (1830). The Edinburgh Encyclopædia. p. 494. ^ Good, Michael. "Some Derivations of E = mc2" (PDF). Archived from the original (PDF) on 7 November 2011. Retrieved 18 March 2011. ^ Thomson, William; Joule, James Prescott; Maxwell, James Clerk; Jenkin, Flemming (1873). "First Report – Cambridge 3 October 1862". In Jenkin, Flemming (ed.). Reports on the Committee on Standards of Electrical Resistance – Appointed by the British Association for the Advancement of Science. London. pp. 1–3. Retrieved 12 May 2011. ^ "Historical context of the SI—Unit of electric current (ampere)". The NIST Reference on Constants, Units and Uncertainty. Retrieved 10 April 2011. ^ "In the beginning... Giovanni Giorgi". International Electrotechnical Commission. 2011. Retrieved 5 April 2011. ^ "System of Measurement Units". IEEE Global History Network. Institute of Electrical and Electronics Engineers (IEEE). Retrieved 21 March 2011. ^ "Notions de physique – Systèmes d'unités" [Symbols used in physics – units of measure] (in French). Hydrelect.info. Retrieved 21 March 2011. ^ Michon, Gérard P (9 September 2000). "Final Answers". Numericana.com. Retrieved 11 October 2012. ^ "Resolution of the 3rd meeting of the CGPM (1901)". General Conference on Weights and Measures. Retrieved 11 October 2012. ^ "Prescribing Information for Liquid Medicines". NHS Scotland. Retrieved 11 November 2018. ^ "NTSB Order No. EA-4510" (PDF). Washington, D.C.: National Transportation Safety Board. 1996. Retrieved 3 August 2008. ^ "ISMP Quarterly Action Agenda: April–June, 1999". Institute for Safe Medication Practices. 14 July 1999. Archived from the original on 12 July 2017. Retrieved 3 August 2008. ^ Williams, Merran (July – August 2003). "The 156-tonne Gimli Glider" (PDF). Flight Safety Australia: 22–27. Retrieved 4 December 2012. ^ "NASA's metric confusion caused Mars orbiter loss". CNN. 30 September 1999. Retrieved 21 August 2007. ^ "Mars Climate Orbiter; Mishap Investigation Board; Phase I Report" (PDF). NASA. 10 November 1999. Retrieved 25 August 2011. ^ "Index to Units & Systems of Units". sizes.com. Archived from the original on 26 August 2012. Retrieved 9 April 2011. ^ "Factors for Units Listed Alphabetically". NIST Guide to the SI. 2 July 2009. Retrieved 14 April 2011. ^ Fenna, Donald (2002). Oxford Dictionary of Weights, Measures and Units. Oxford: Oxford University Press. ISBN 978-0-19-860522-5. ^ BS350:Part 1:1974 Conversion factors and tables Part 1. Basis of tables. Conversion factors. British Standards Institution. 1974. p. 7.